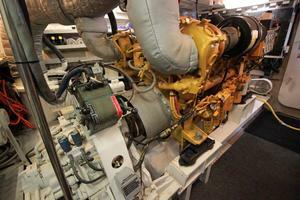 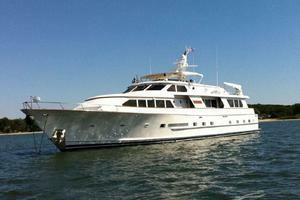 $1.4MM REFIT 2007/2010 INCLUDING RE-POWERING USED W/CAT C-32S: 22 KNOTS TOP & 17 CRUISE. 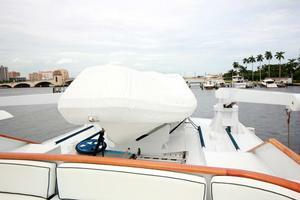 REFIT BY MAJOR FLL SHIPYARD, & SUPERVISED BY PATTON MARINE SURVEYORS. 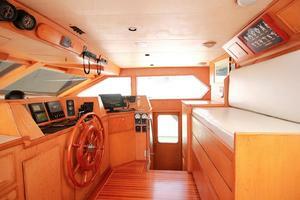 NEW TEAK DECKS, NEW ELECTRONICS, TANKS TESTED, & INTERIOR DECOR UPGRADES. 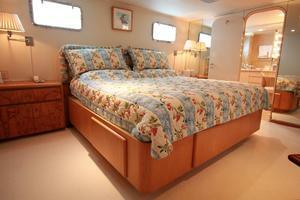 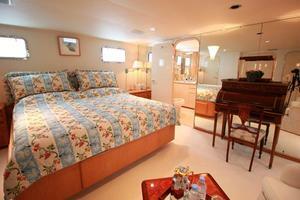 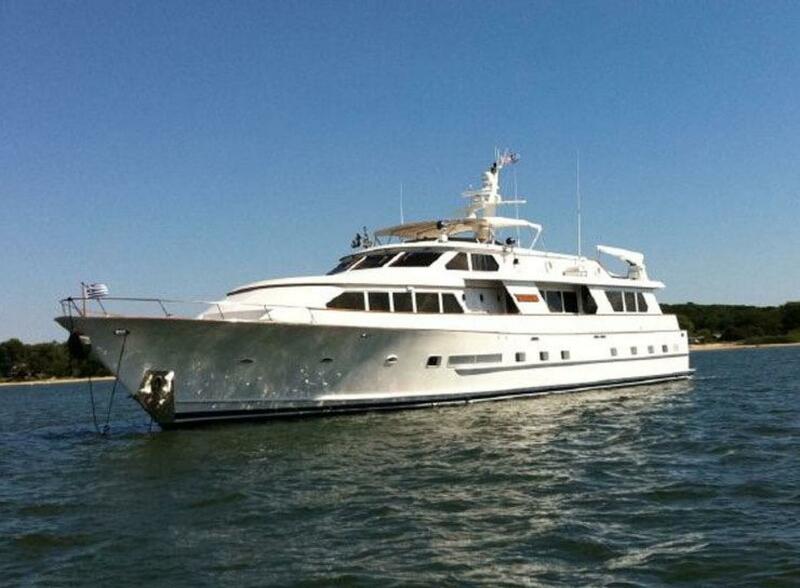 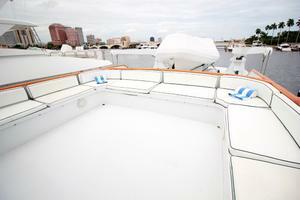 Classic Styling and Spacious interior with 3 Staterooms & 4 Heads - Huge Salon & Aft Deck. 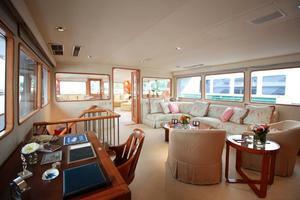 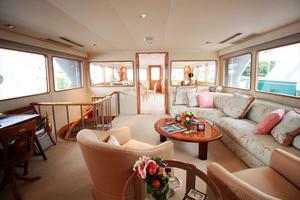 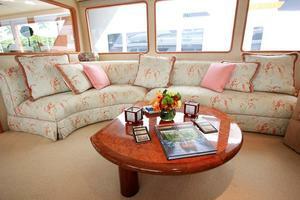 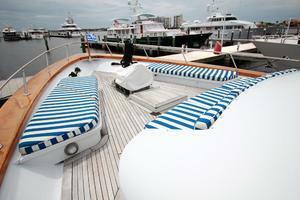 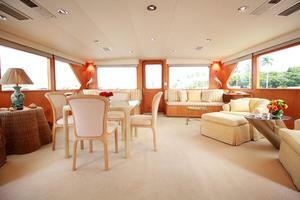 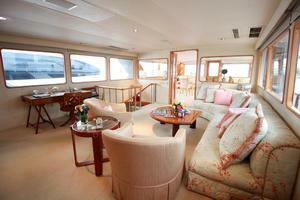 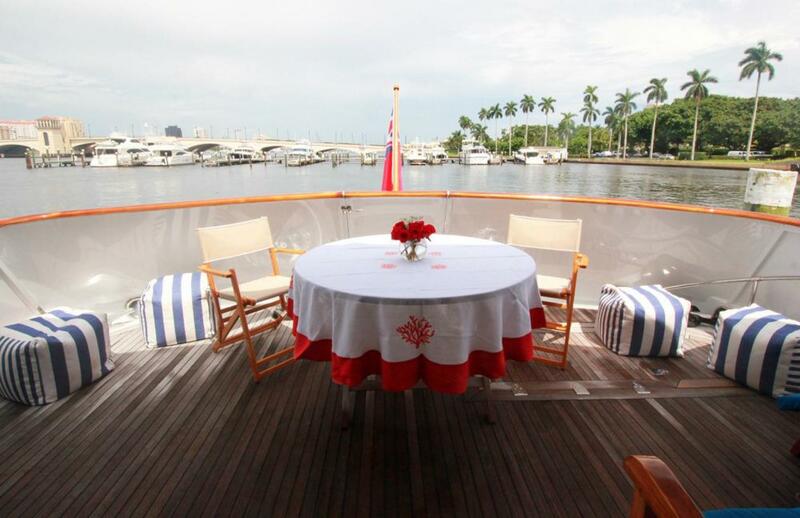 ZANTINO III is a Classic Motor Yacht - In Styling and Accommodations. 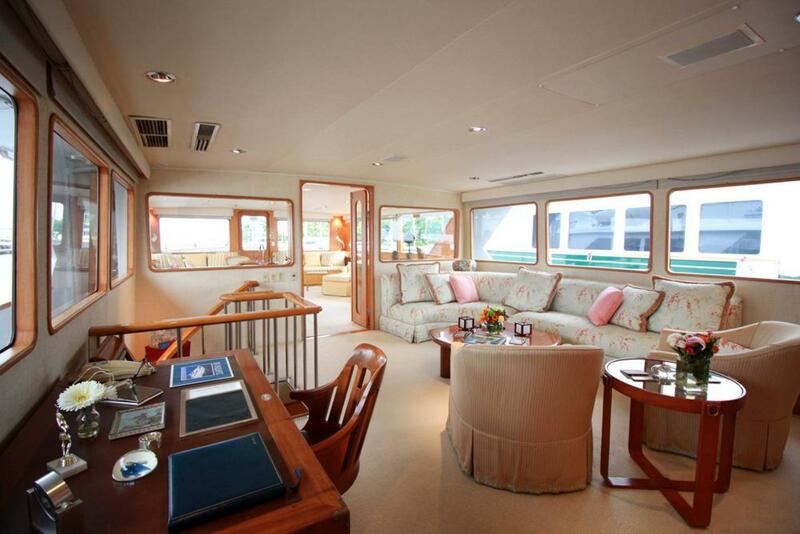 With full side-deck walk-arounds, guests would typically enter through either Port or Starboard Wing Doors to the spacious, enclosed and air-conditioned AFT SALON. There is also an open AFT DECK, accessed through a teak door, and is large enough for entertaining or casual dining...with a newly installed Teak Deck. 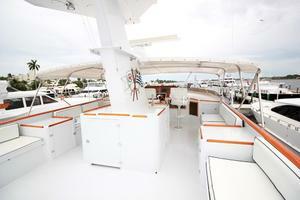 The Spiral Staircase in the Port Corner of the AFT DECK leads to the GENERATOR/MACHINERY ROOM and SWIM PLATFORM. 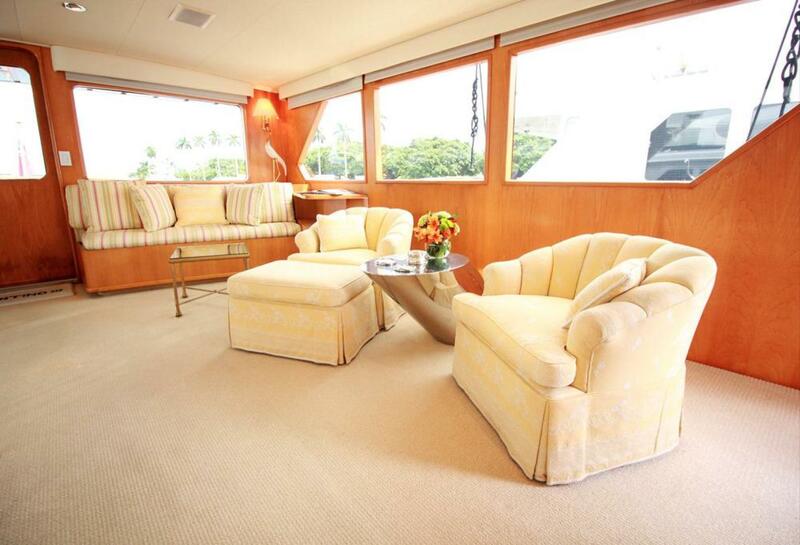 In the MAIN SALON, there are two different seating areas, with a large L-Shaped ("Convertible") Couch that provide pull-out beds for that occasional, unexpected overnight guest or grandchildren. 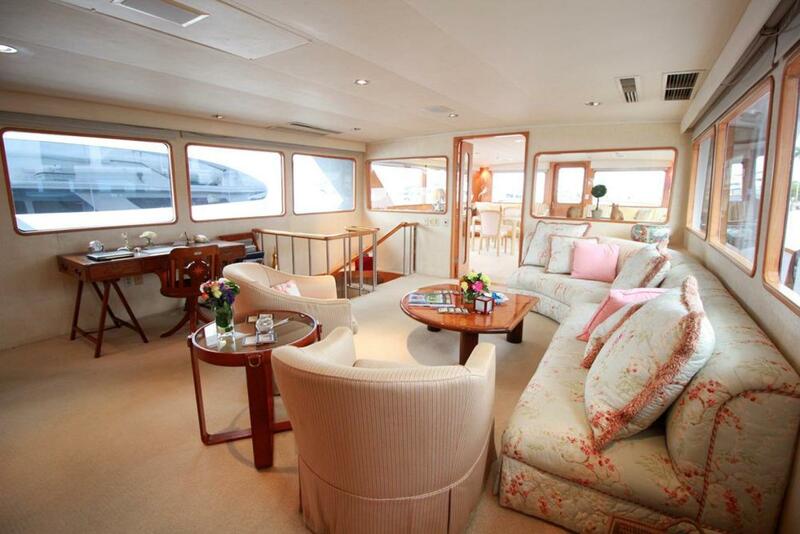 The Owner's Desk in forward and to starboard, with some additional seating and a table for four...for meetings or a card game. Walking forward along the starboard passageway, the POWDER ROOM is on the left, with a head and sink, adjacent to the PILOT HOUSE. 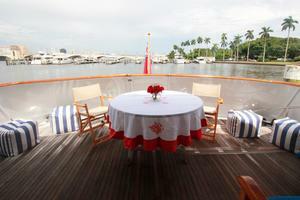 The FORMAL DINING SALON is just forward of the RAISED PILOT HOUSE, and on the same level as the MAIN SALON. 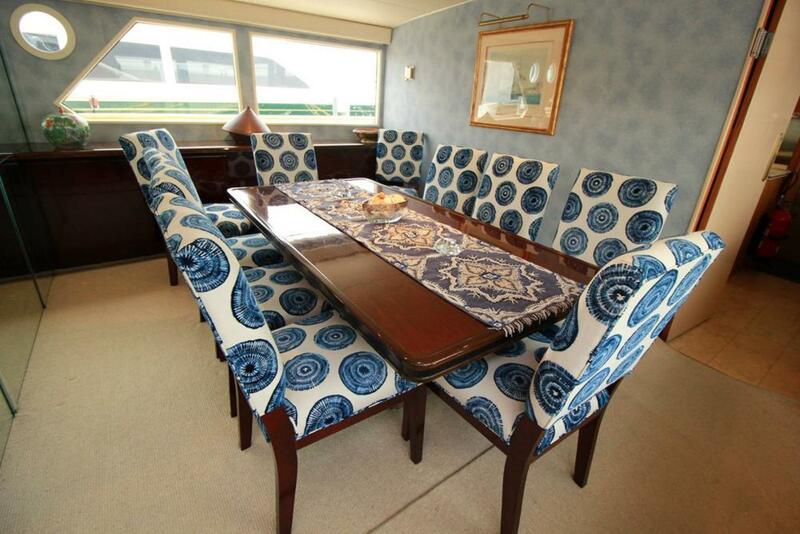 The DINING SALON is classic, yet bright and comfortable, with seating for Six or Eight in blue and white upholstered chairs - around the highly polished Mahogany Dining Table. 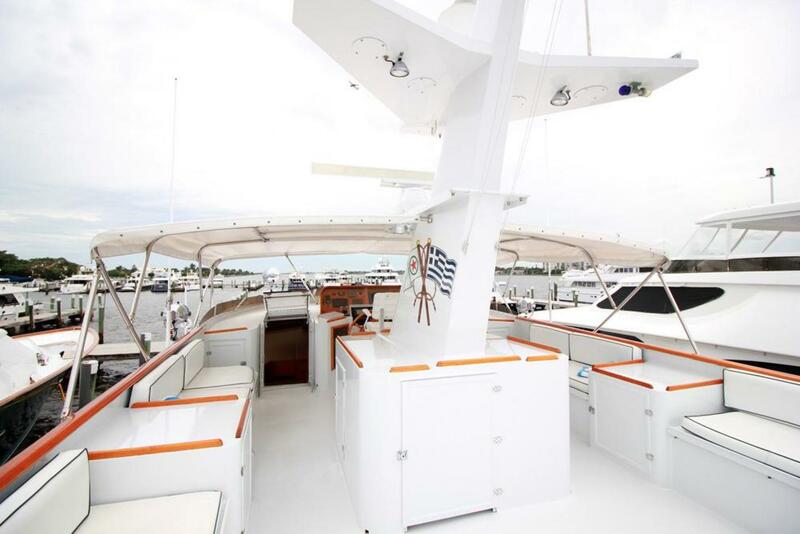 A custom Buffet is installed along the starboard side, with a striking Granite Top, with four swing-out SS cylindrical cabinets for dish and cutlery storage. 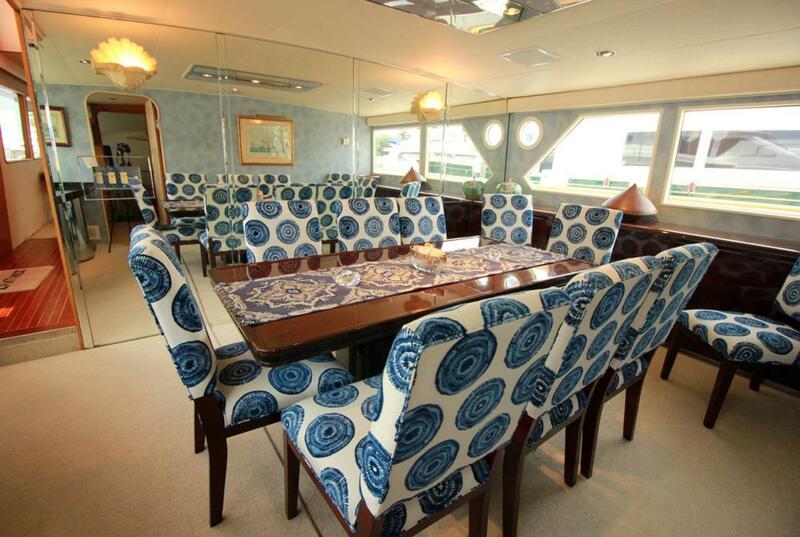 Through the swinging door on the forward starboard side of the DINING SALON is the GALLEY, where the Appliances have all been upgraded for the most efficient and professional preparation and service. 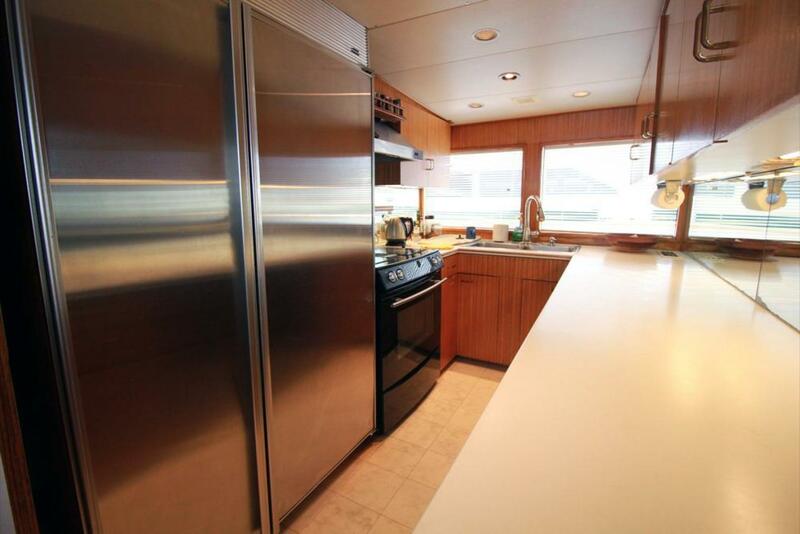 There is a new Sub-Zero Double Door SS Refrigerator & Freezer, a new Dishwasher, two additional 7 cubic foot under-counter Refrigerators, an Ice Maker, Microwave, a "Jenn-Aire" Convection Oven with Extraction Fan, a Trash Compactor, a Double SS SInk, and plenty of Drawer and Storage Space. Stairs on the forward, starboard corner of the GALLEY lead to the CREWS' QUARTERS and the ENGINE ROOM. 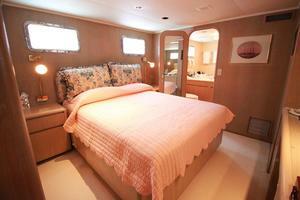 CREWS' QUARTERS accommodations are for four, and the mattresses, wall coverings, and new carpet was installed during the 2007 refit. 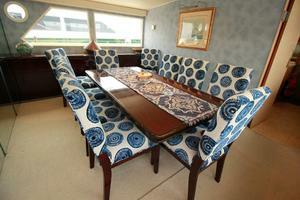 There were miscellaneous joinery upgrades and repairs made as well. 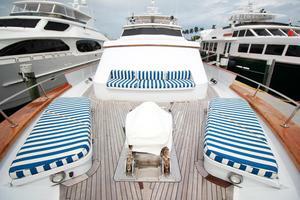 There are two heads, one for the Captain's Quarters and the second for the Crew. 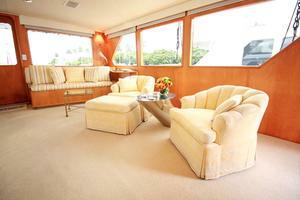 There is a CREWS' MESS, with a dinette and settee, which is adjacent to the Laundry Area. 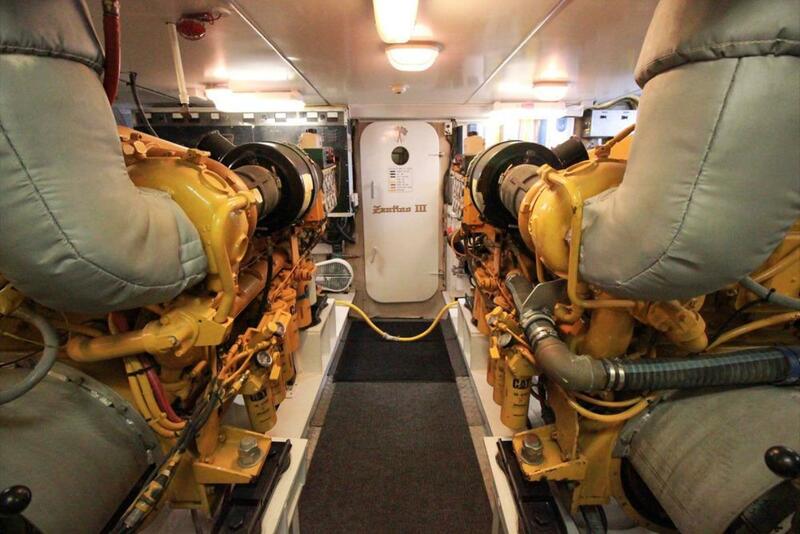 The ENGINE ROOM is full-height, with plenty of headroom and light to service the new CAT C-32 Diesel Engines, along with the other Engine Room Equipment. The GENERATOR/MACHINERY ROOM is located all the way aft, just forward of the Transom, which allows a better balance and longitudinal center of gravity, and easier access to maintain the Mechanical and Electrical components. 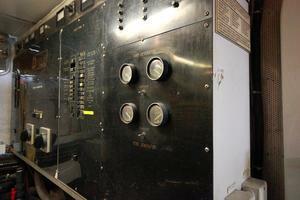 Located there, are two new Air Conditioning Chillers, with two new self-priming raw water pumps, with integral expansion tanks. On the port side is the "John Deere" 50 kW Generator, fitted with "Soft" Sound Shield for noise attenuation. Alongside is the 40 Gallons per Day Water Maker. 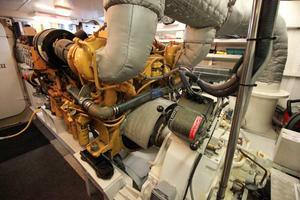 To Starboard is the new 80 kW "Northern Lights" Generator, fitted with a PTO for the Hydraulic Bow Thruster. 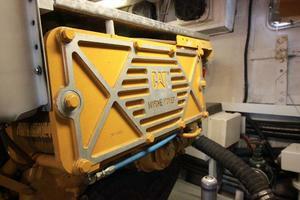 A second ship's Water Heater is also located on the starboard side. 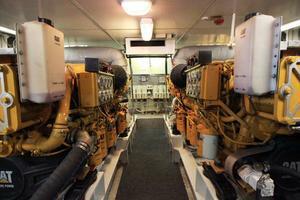 There are two Electrical Panels for the Shore Power System, and the Generator and Ship's Service Batteries are also located in this Machinery Space. 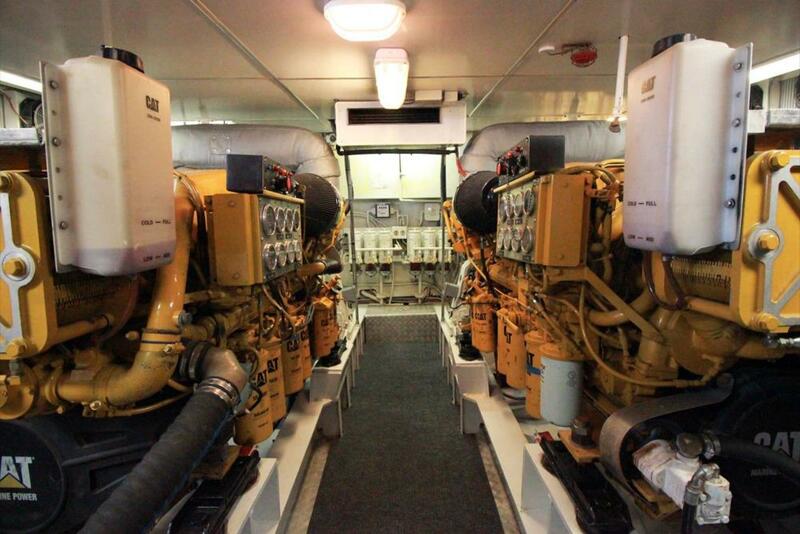 along with the Power Units for the Capstans and Davits. An Emergency Steering System is installed on the center line of the vessel - easily accessible when needed. 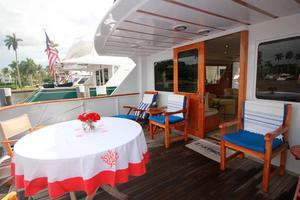 The PILOT HOUSE is "Raised" approximately four feet above the MAIN DECK, for greater visibility and privacy for the Captain while underway, particularly for night cruising. 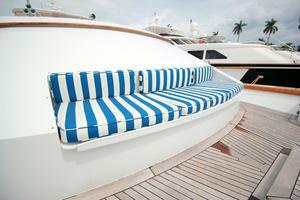 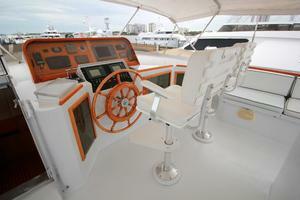 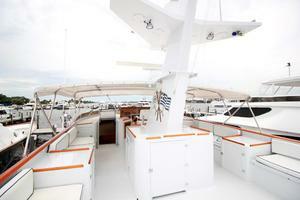 There is a Bench Seat directly behind the HELM STATION, which does allow for Observation, with Chart Drawer built in. 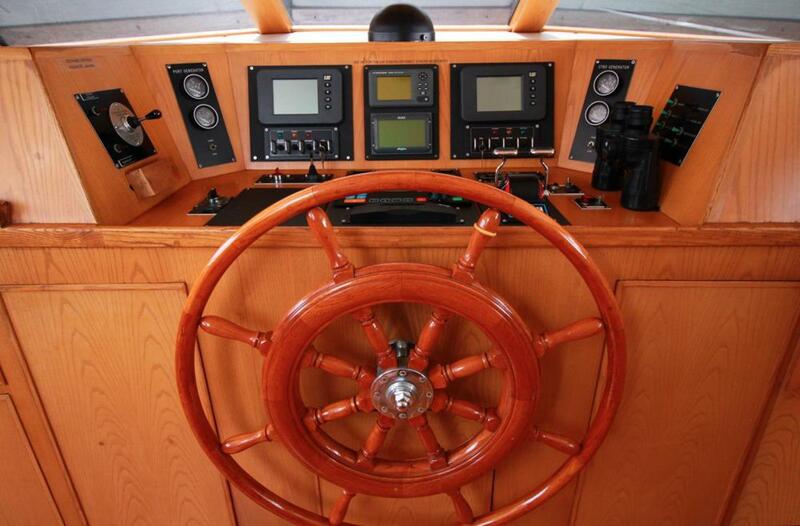 There is a Navigation Area on the port side of console, with all the ELECTRONICS and Instrumentation built in to a custom upper and lower console. The ELECTRONICS have been continually upgraded, with the most recent upgrade that of the Sat TV system. There are new Flat Screens installed, a new computer-plotter, "WI-FI," and a host of other navigation equipment and instrumentation, such as the "NAIAD" Stabilizer and Bow Thruster controls, fuel, fresh and black water tank gauges, and a complete Alarm Panel. Under the floor of the RAISED PILOT HOUSE, is the "Plenum" and Storage area, where various Electrical Panels (12V DC, 24V DC, and 110V AC Sub Panels are installed. The Exterior SIDE and FOREDECK are Teak, and there is a comfortable seating area, with cushions and covers, built in to the forward Trunk Cabin of the Aluminum Superstructure. 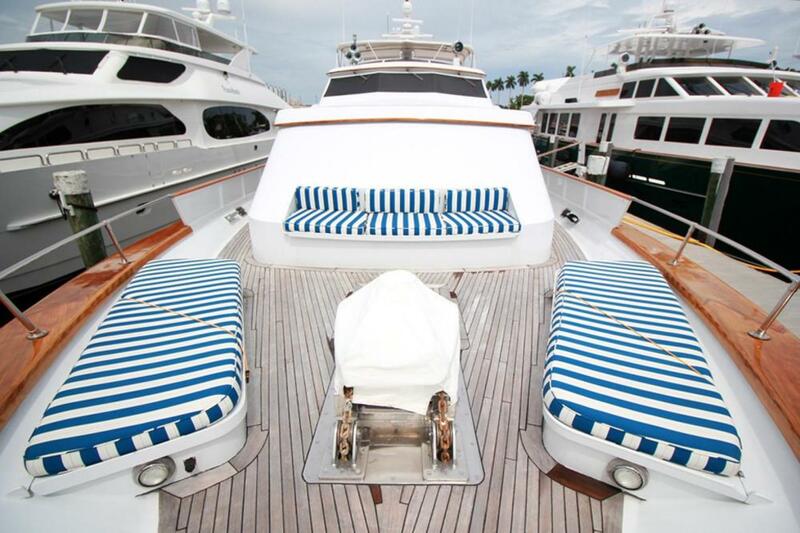 Port and Starboard Aluminum Deck Storage Boxes are covered with cushions and covers, and provide additional seating and/or places to sun and enjoy the cruise. The is a large hatch above the CREWS' QUARTERS on the Center line, and a heavy-duty double "IDEAL" (A?C) windlass, with "frequency" drive (a recent upgrade), with a center/top Capstan for mooring and towing. Directly below the Windlass is a Partitioned Chain Locker with sheathing and drainage, with double "Stockle" Anchor port and starboard, Hull-Guides, each with 300 feet of chain, and SS Hull Anchor Plates. 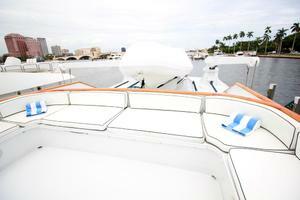 The FLY BRIDGE is accessed through stairs and a hatch from the port side of the PILOT HOUSE. 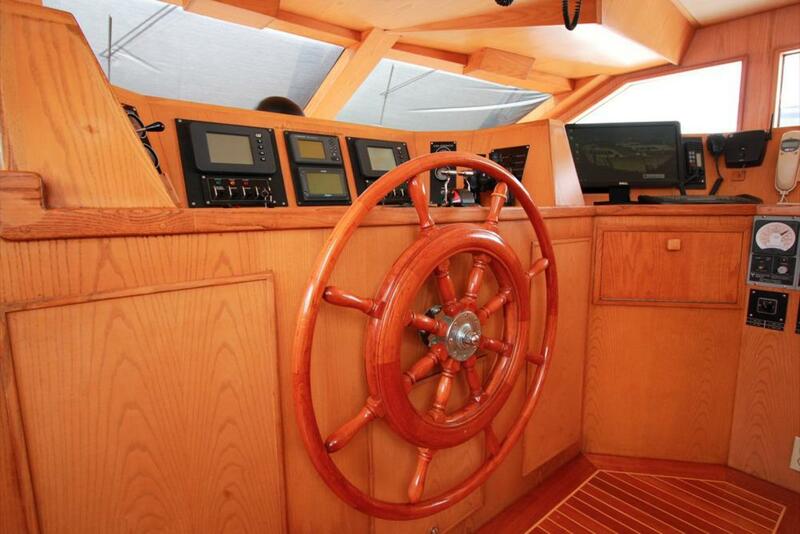 As you arrive on the FLY BRIDGE, the Upper Helm Station is to your left on the Center-line, with a second set of Controls and Electronics. 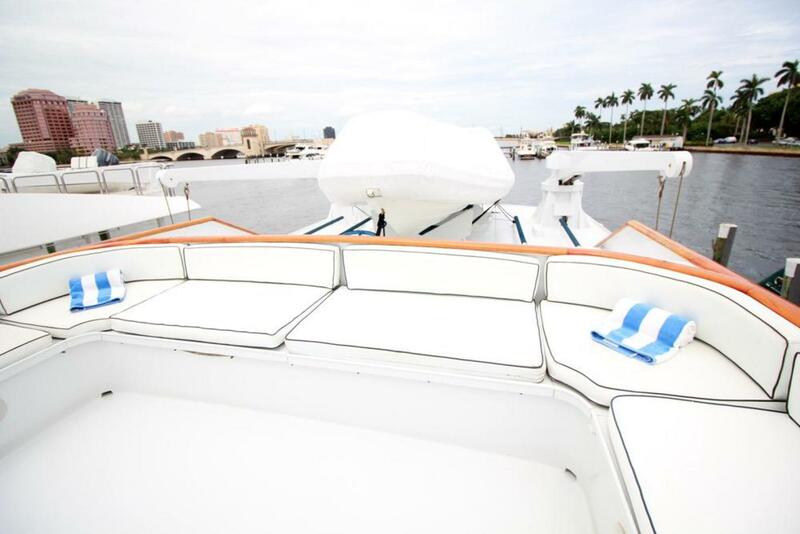 The forward section of the FLY BRIDGE is covered by the newly-recovered Bimini Top, providing shade for the Captain and guests who want to enjoy a cooler ride, out of the sun. 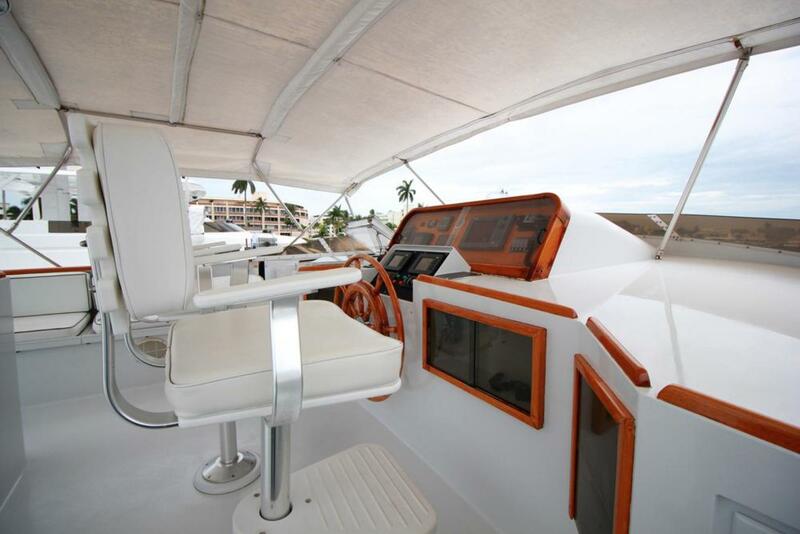 Twin Helm Chairs provide seating directly behind the Helm, and the large Aluminum MAST ISLAND dominates the center of the FLY BRIDGE, and supports the base of the large, two section hinged Aluminum Mast, home for all the necessary Antennas for Radar, SAT TV, Radios, Wind Indicator, etc., as well as the aft terminus of the Bimini Top. 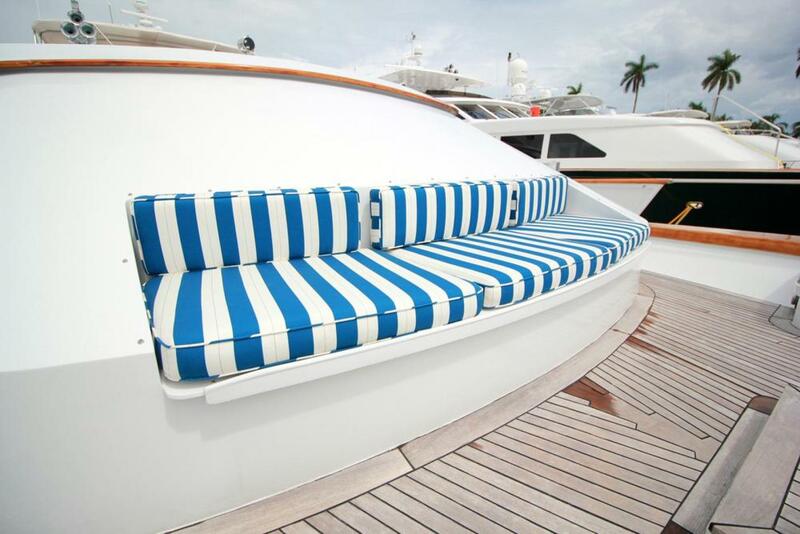 There is almost sixty feet of aluminum built-in bench seating, with cushions, covers, and lots of storage for Life Jackets, etc., and a great place to enjoy the sun and outdoors. Aft of the FLY BRIDGE is the BOAT DECK, with two Heavy Duty Davits, one each to port and starboard, to handle the Dinghy and Jet Skis, and other water toys. 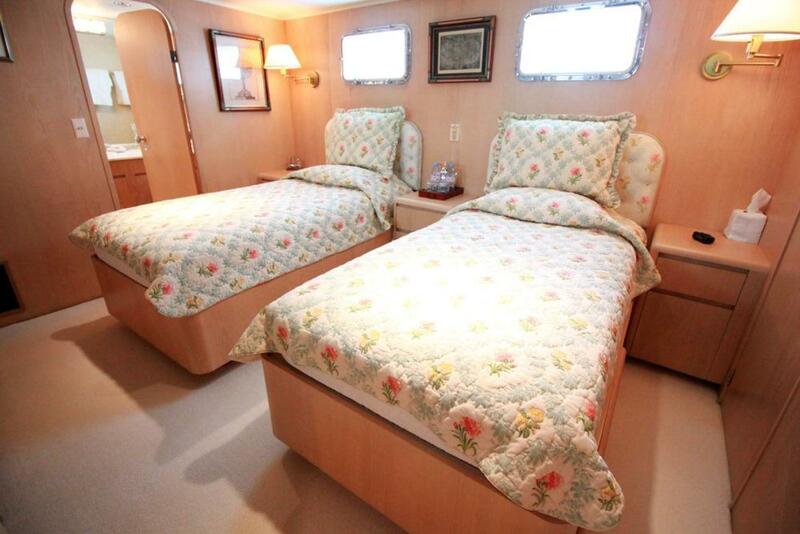 The MASTER STATEROOM is Extra Spacious, and with "His & Hers" Heads, it can easily be split into two Stateroom, if a new owner would want a four Stateroom boat for Charter. The MASTER STATEROOM, as presently configured, has the King-Size berth to starboard, with the entrance to the Stateroom, at the far port side, providing a very dramatic entrance. Built-in teak night stands flank each side of the King-Size Berth, with both providing lots of storage and drawers beneath. There are two chairs and a table at the end of the Berth, giving the space the feel of a "Grande Suite." A Full-Length Dresser and Entertainment Center are built-in along the port side of the hull, with lots of drawers. 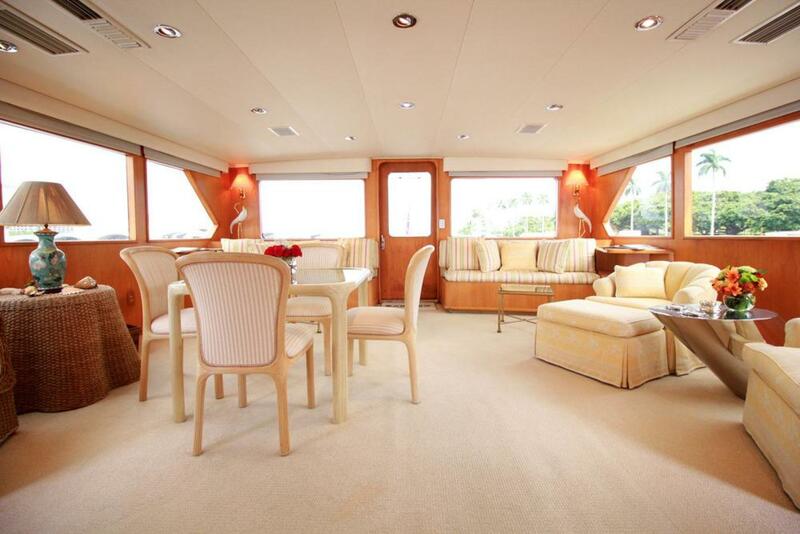 The Aft Bulkhead is mirrored, full-length, giving the room an even more spacious look. 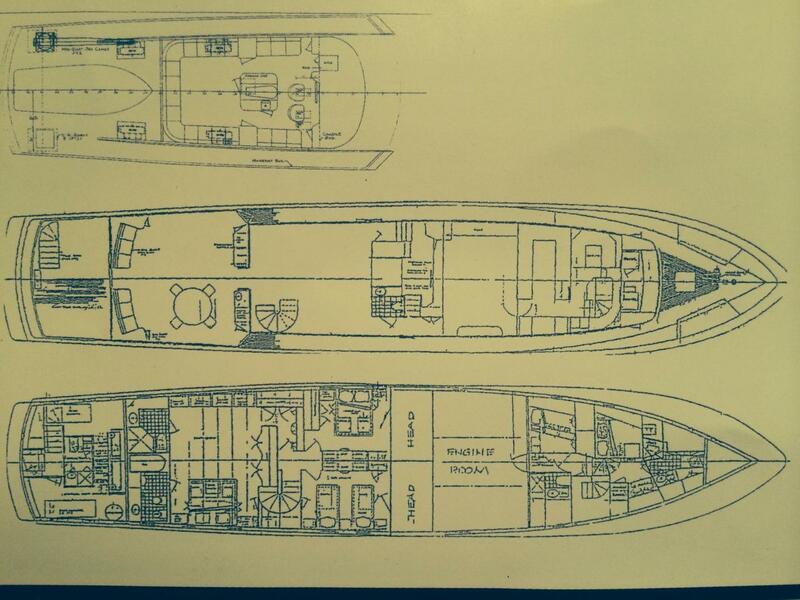 The "His (port side with shower) and Hers (starboard side with full tub)" Heads are against the aft bulkhead, providing a nice "Buffer" from the Generator/Machinery Room. 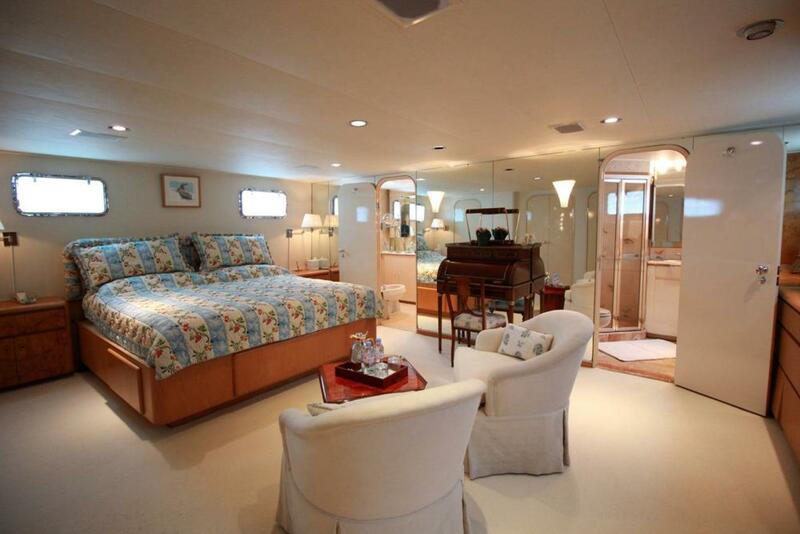 The "VIP STATEROOM" is located to Port and forward of the MASTER STATEROOM, and features a Queen-Size Berth, with storage under, and a built-in Dresser and Vanity is directly across from the foot of the bed, with a full height mirror above. The full Head and shower is against the Forward Bulkhead, providing a sound "Buffer" from the ENGINE ROOM. 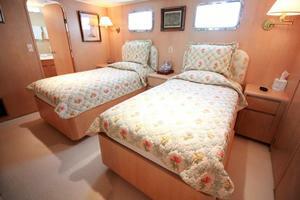 The TWIN GUEST STATEROOM is located on the Starboard side, and has Twin Berths, each with Storage under, and a night stand between the berths. 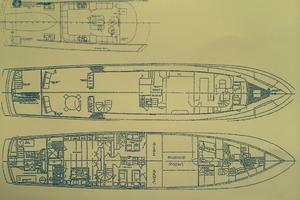 The full en-suite Head and Shower, like that of the VIP STATEROOM, are against the forward Bulkhead, providing that extra sound "Buffer" from the well-insulated ENGINE ROOM.